Myth, Mystery and Crime in the 19th Century British Isles. 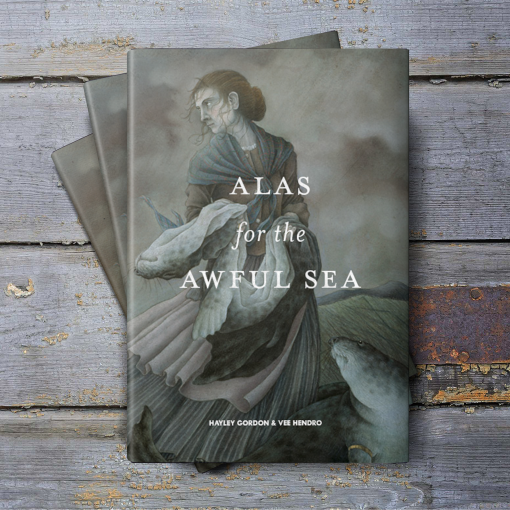 This is the HARDCOVER + PDF of Alas for the Awful Sea. You will be able to download the PDF immediately after payment. Please note, you will need to pay all applicable VAT and customs duties upon delivery of the book. This includes purchasers from the EU. Please make sure to provide any other information necessary for delivery to your country, such as tax number, etc. You can download all the play materials you’ll need for the game from our website, or or by clicking here. 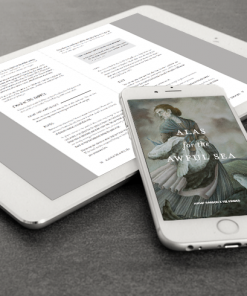 Alas for the Awful Sea is a story-focused tabletop roleplaying game about a ship’s crew navigating the remote British Isles. There, they face a world consumed with suspicion, sadness, and desperation. Struggles for power have deadly consequences; mysterious disappearances plague the region; and those who seem human may not all be so. Amidst all this, the sea sends forth strange messages. Will you be the one to listen? Introduction, Setting and How to Play. 10 Character Roles, and 6 Character Descriptors to choose from, including custom moves. Alas for the Awful Sea: A self-contained adventure that takes four or more sessions to play. Expanding Horizons: A GM’s guide to creating compelling and thematic stories within the world of Alas. Chapters on Folklore, Historical Happenings, and more.